I’ve been doing a fair bit of fermenting here the last few weeks, with some successes, and some screw-ups here and there. But one of my successes has been what we call “pink things”. What they are, in fact, are sticks of rutabaga, lactofermented with garlic and beet in brine. 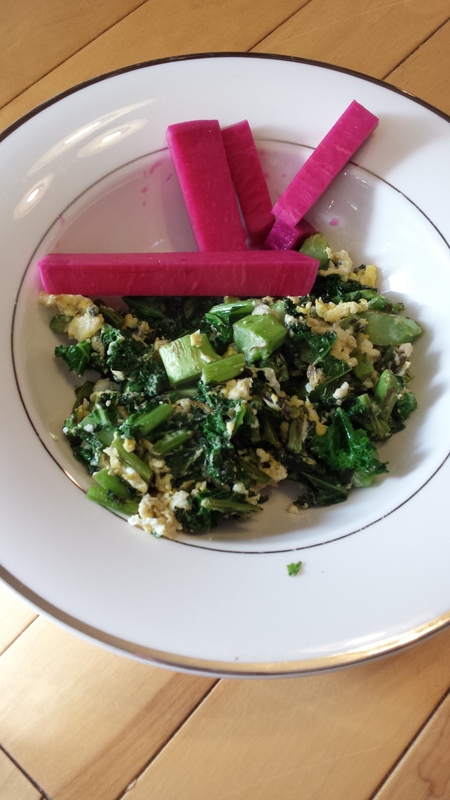 The beet chunks mixed in with the rutabaga make everything turn a vibrant pink, while the garlic just makes it yummy. I think these are the brilliant pink condiments that Lebanese restaurants add to Shawarma. 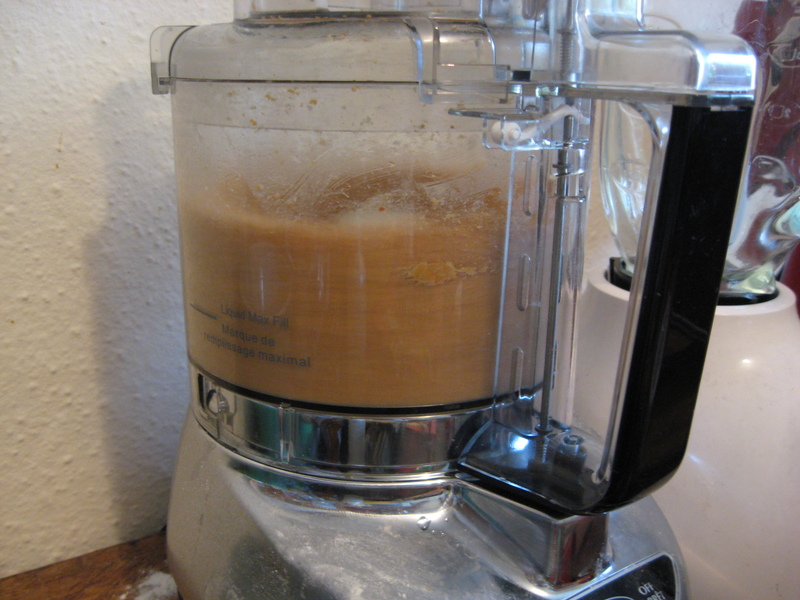 Rutabaga are under a dollar a pound at this time of year–making this one frugal ferment! I though I had shared my recipe on my blog before, but when I searched, I couldn’t find it. So here it is! Peel rutabaga and cut into spears, about the size of your pinky finger. Dice beets. Bruise or crush the garlic cloves so that the flavour will emerge but the cloves will stay intact. Divide the ingredients evenly between the pint jars, making sure there is at least one clove of garlic per jar, and a small handful of beet chunks. When the veggies are divided up, pour brine over it all to cover. The veggies should stay submerged beneath the brine: you can use a lid from a smaller jar, maybe weighted down with a stone that you have boiled to sterilize. The lids should be put on "fingertip tight" to allow carbon dioxide, produced during the fermentation, to escape. Leave on the counter for several days, maybe 3 days if the weather is warm, and as long as a week if it is cooler. They will lose the “raw” taste, the beets will start seeping colour into the brine, and the whole thing will take on a dark shade of pink. If they smell alcoholic, or grow a lot of mold, throw them out and try again with fresh ingredients and sterile jars. Using filtered or distilled water can also help if you have problems. These disappear pretty quickly at my house! I hope they are as popular at yours. What a frugal way to get some gut-supporting probiotics, in the form of a delicious condiment! 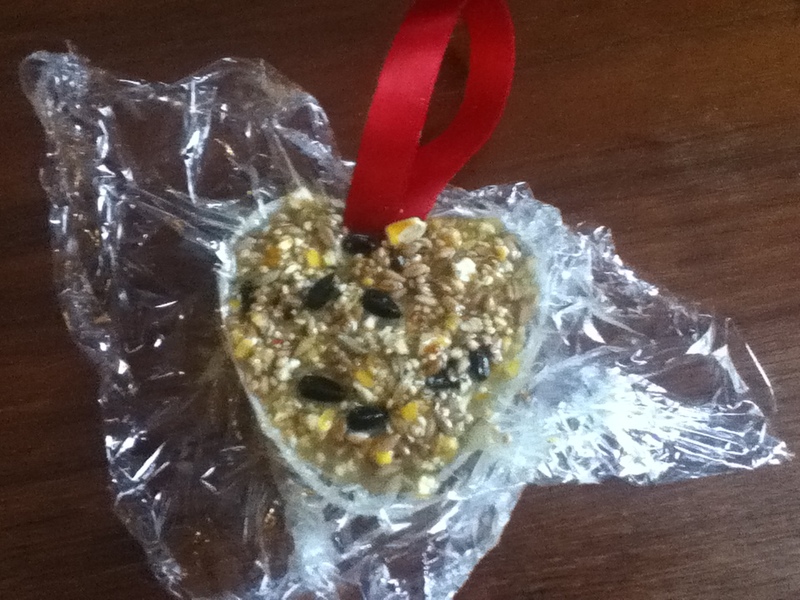 There are pictures out there on Pinterest of these beautiful heart-shaped bird treat ornaments made with bird seed mixed with gelatine. Unfortunately, I tried those and they failed miserably, never hardening at all. How disappointing. 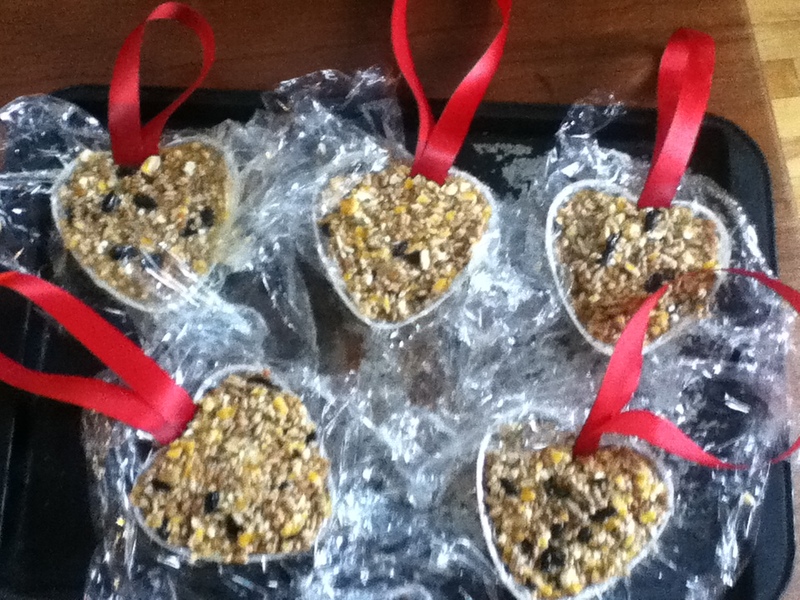 However, I thought this year that a fool-proof alternative would be to make something similar, but this time with suet! So I saved my fat skimmed from various meats (I do often use those skimmings for cooking and frying, but sometimes I have extra) over the last few months in a can in my freezer. 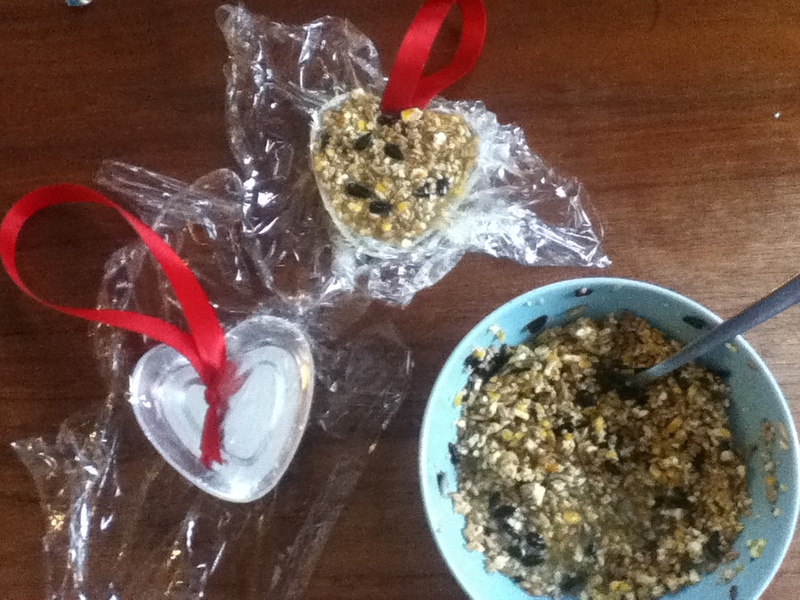 Today I used the fat to make lovely bird treats! Assemble your materials and ingredients. Warm fat until it is liquified. 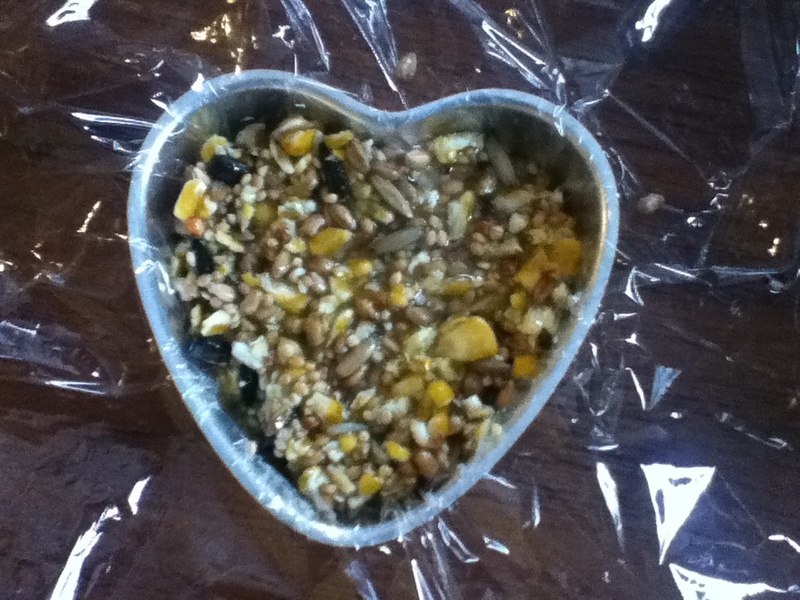 Mix it with bird seed until it is a uniform mixture. A little on the liquidy side would be better than too dry, to make sure everything will stick together. It should cool while you stir. Make sure it is not too hot for you to handle, especially if working with children. Place plastic wrap over your mould form (this will make it easy to pop out. If you have a silicone muffin tray, you won’t need plastic wrap. Spoon a thin layer of seed mixture into the mould. Take a length of ribbon and knot it on one end to form a loop. Place the knotted end on top of your first layer of bird seed mixture. 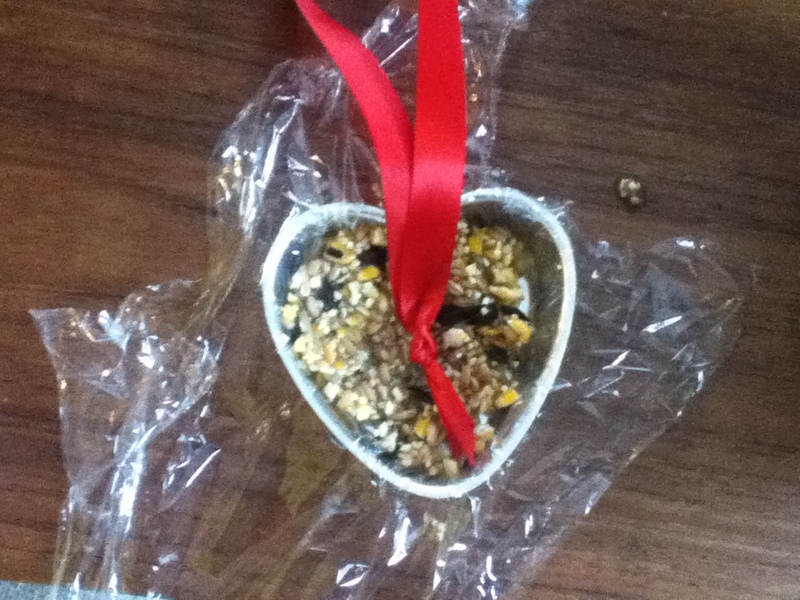 Fill the rest of the mould up with seed mixture, burying the ribbon in the centre. Let these chill outside or in the fridge or freezer. It didn’t take long for them to hold their shape. We made several batches, and popped the semi-firmed ones out to continue chilling while we worked on the next batch. 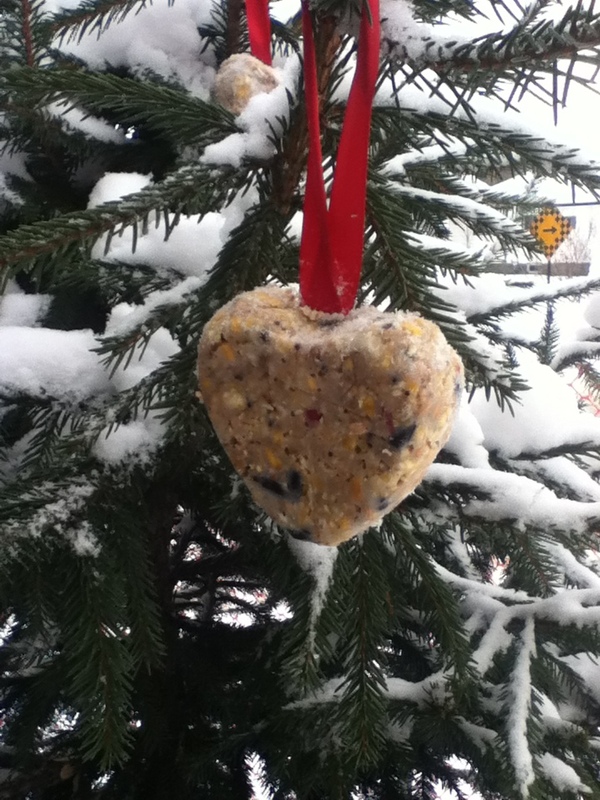 Pop them out of the mould and hang them outside where you will have a good view of them, and enjoy keeping those little birdies alive through another cold Northern Ontario winter! If you’re anything like me, you might find yourself dealing with a daily afternoon craving for something sweet, caffienated, or both. For me, it’s both–and I don’t mean just sweetened coffee. No, I mean I want a coffee AND a sweet baked something, plus maybe a handful of chocolate chips for good measure. Well, I’ve discovered a little solution to this problem quite by accident. It happened when instead of throwing out the half-pot of un-drunk tea, I stuck it in an empty yogurt container and squeezed in the juice from a leftover half a lemon. My husband scoffed. I shrugged my shoulders–waste not, want not I figured as I stuck it in the fridge, though I was a bit sceptical as to how this would turn out. It was chai tea after all–not a usual flavour for iced tea. I was thirsty the next afternoon so I pulled out my tub-o-tea, spooned in some sugar and took a sip. Eureka! It was delicious–cold and sweet and lemony, blending perfectly with the chai spices. Plus I found it satisfying both my sugar craving and giving me my caffeine fix, but without any jittery feelings that sometimes accompany that afternoon extra cup. So this is my new thing: never waste tea. Actually, it’s so good I’ve been making it intentionally. Brew tea, stick in fridge with lemon juice. Stir in sugar. And then grab a cookie. You deserve it for being so damn clever. Some times you have to spend money to save money. It’s a hard, cruel fact. One that I’ve ignored for far too long. Today I broke the bank with pyrex, but it should save us a bunch of money in the long run! Now that we’re doing Your Money or Your Life step 2 (part 2)–which involves tracking every cent that comes into and goes out of our lives–I’ve realized just how much money is being spent on food outside the home. Lots! One area where we have fallen down is in organizing my partner’s lunches at work. When he doesn’t bring something from home, his lunches out can easily cost around $10 per day. And that doesn’t count the $5 afternoon Starbucks run. Fifteen bucks a day adds up quick, and my partner is the first to admit that the food is crappy and not worth it. Now that the baby is eight and a half months, things are beginning to stabilize a bit in our household, and we can start building some systems again, start re-organizing. So we had a chat about the lunches, and came up with a strategy for reducing his food costs at work. 1. Try to do better with leftovers. I always “intend” to make sure there are leftovers to take, but too often I forget to actually allow for them in my cooking. Leftovers will be priority #1. 2. Make big-batch home-made “frozen” lunches. This is where the pyrex comes in. I finally broke down and bought five glass freezer containers suitable for a decent portion of food for my partner’s lunch. My idea is to do just like the frozen dinners do and have a bed of noodles or rice dumped over with a good helping of sauce. Only this version will be home made, and it will be super duper cheap! So, today I did a big batch of spaghetti. 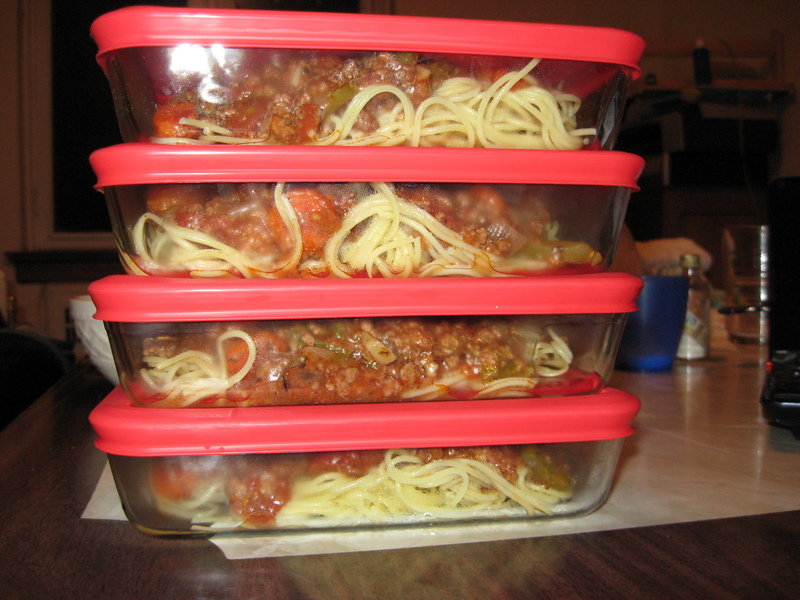 We ate a good helping for dinner, and then I made more noodles and packed up five yummy portions for frozen lunches. Easy peasy lemon squeezy. I’m planning to make big meaty saucy stewy meals every Sunday from now on to stock up the frozen lunches for the week. These home-made frozen dinners will be priority #2. 3. Buy enough frozen meals to last a week. My partner doesn’t mind the President’s Choice frozen Indian dishes, so I will try to make sure there are at least five in our freezer at the start of the week. That way, if we fall down on #1 and #2, at least he has those. 4. Make cookies. What can I say? My man likes my cookies. I figure for the cost of maybe two cookies at Starbucks, I could make a full batch of cookies at home. If I make them, he’ll eat them. And we all save money. So there you have it: the new plan. It involves a lot of Sunday cooking and shopping, but I think we’re ready for it. There is a lot to be said for getting ready for the week on the weekend, instead of playing catch-up the rest of the days. I also wanted to add that today I shopped at the Isabella Loblaws and found some great sales. First off, the PC frozen meals were on sale for $3 each, so I bought enough for two weeks. There were also all these bread products, reduced to 50% off. Due date: June 15! I don’t know who is getting fired over this, but I got a loaf of bread, a bag of english muffins, and two bags of bagels, each for between $1 and $1.50. So we are really really really well stocked at the moment. It feels good. But MAN my freezer is full! I didn’t buy the cow, but I got the milk for free . . . Raw organic pastured milk, that is. I was going to buy a cow share, but in the end took a long hard look at the budget and decided against it. The very sweet farmer, after hearing my budget constraints, sent a free bottle of milk along for me with my friend who did sign herself up for his milk. So I became the owner of 1.5 litres of raw milk. It had nearly 3 cm of cream on top, and it smelled like a fragrant pasture. There are many health benefits attributed to raw, pastured, unhomogenized dairy products; access to this kind of “real milk” is lobbied for by the Weston A. Price Foundation. The only thing was that I found it just a little bit different from what I’m used to. So instead of pouring it over my cereal, I used some for making pancakes, and the rest, I used for making yogurt. I took a very low-tech approach, as outlined below. 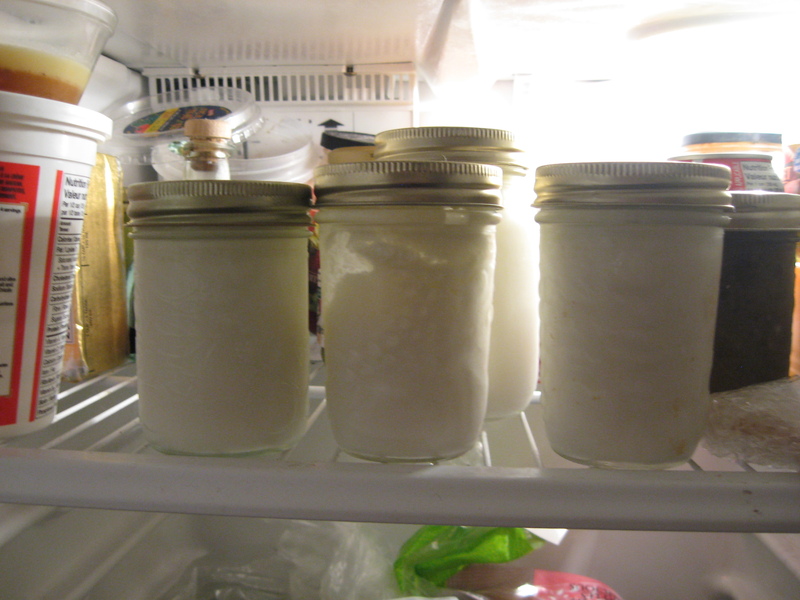 Keep in mind, the milk is no longer “raw”, as heating for yogurt effectively pasteurizes it. Warm up slow cooker on low setting. Add hot tap water. Heat milk in a saucepan on the stove until frothy and steamy. Then cool the milk by placing the saucepan in a sink of cold water and stirring the milk. Cool the milk until it is “warm-hot, not owie hot” (as my daughter would say). Add active yogurt–approx. 2 tbsp yogurt per four cups of milk–and whisk until combined. Pour into clean mason jars and place jars in the slow cooker, making sure the hot water does not rise above the jars. Turn off/unplug the slow cooker and wrap it with towels. Let sit for several hours. The longer you let it sit, the firmer and more sour the yogurt will be. Remove from slow cooker, place lids on jars, and refrigerate. The yogurt will firm up as it cools. It’s like magic: milk alchemy! I was so excited to be making yogurt that I kept on wanting to lift up the towels to take a peek–a peek of what, I have no idea! But it worked, and I’m stoked. The sourness of the yogurt works very well with the more complex flavour of the pastured milk. And the price is better than any organic yogurt out there, even with the $3 per litre price tag. And hey–no more plastic yogurt tubs to stress about! How about you? Do you make yogurt? Have you tried raw or pastured milk?